... didn't always refer to a tomato-based product - and in fact, in some places, it continues to mean something quite different. There are multiple theories on the subject, and whether you follow the Chinese or Malay etymologies, what you get is some kind of savoury sauce (the Chinese version is apparently made from fish brine, while the Malay version refers to soy sauce). If you go back to earlier dictionaries you'll find that ketchup had a more amorphous meaning - as late as the 1990 Webster's, which had it generally as a sauce for meat or fish, similar to the European-Arabic theory of etymology. It seems that over time the definition has become more specific - tomato-based in the Western world (remember the time not too long ago when we had to define it as 'tomato ketchup' or 'chilli ketchup?) and soy sauce in Southeast Asia, or 'kicap' ("kee-chap") as we know it. If the Malay roots to it are accurate, it is only one of a handful of words that have been contributed to the English language. The others that I'm familiar with are 'orangutan' (with emphases on the 1st and 3rd syllables, and the 'a' as in 'far'), and 'amok'. 'orangutan' (with emphases on the 1st and 3rd syllables, and the 'a' as in 'far'), and 'amok'. Hmm, good point. Though I've always wondered if it came from 'sauté'. It might have ketchup on the label but it's tomato sauce to me. I'm with Sally on this one. Ketchup is something Americans use, not me. Heinz, American: "tomato ketchup", i.e. not just ketchup. To me, ketchup is a (type of) sauce. 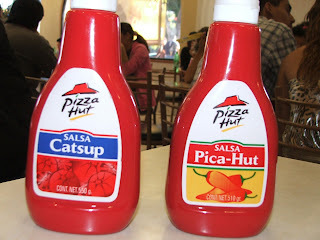 The "tomato" in the name is because at the time of introduction, ketchup sauces based on other ingredients were common. Mushroom ketchup is reasonably well known. There's always a bottle of it in our pantry, mainly used in connexion with husband's famous burger recipe. Less well known - except in the Philippines, where it is a popular condiment - is banana ketchup. This was invented in the 40s at a time when tomatoes were in short supply, and is used in most of the same ways that we use tomato ketchup. Banana ketchup is naturally a rather unappealing yellow-brown colour that swot would probably recognize. But as sold in bottles in the Philippines, it's usually dyed red. I.e. more than two hands full. I have in my larder a couple of jars of home-made green tomato ketchup. That is, it's made with green tomatoes, though it looks more like brown sauce. Back in the days o Domestic Science lessons, our teachers used to make green tomato chutney. The wretched stuff stank all over the main building. In Subway, it was called 'red sauce' which, while an accurate description of the stuff, made me a bit sad nonetheless. It's not that hard to say ketchup or tomato. I was a horrible language snob at the time though. I cringed inwardly when adults ordered a 'bokkul' of coke or when people pronounced 'jalepeno' with an English 'j'. I let go of that particular prejudice when I went to the excellent Tapas restaurant in Lancaster and found out that I'd been mispronouncing 'chorizo' quite badly. Also, when the local shops are overladen with mangos and are selling the large ones 3 for £1, I've made mango ketchup, which goes really well with cold cooked white meat (pork/chicken) and veggies. For anyone interested in trying to make it, I put the pulp of the mango in a blender with sugar, salt, pepper, garlic, ginger, and various other spices to taste, then add balsamic and a good wine vinegar - you need a combination of the two because balsamic is very acidic, but the wine vinegar isn't, so they combine well and both add their own taste. Blend the whole lot till it's a puree, I tend to sieve it to make sure everything is mashed. Then heat in a pan over a very low heat, stirring regularly, untill it reduces to a thick mixture. I then let it cool and leave it in the fridge. I've noticed that the flavour changes slightly after a few days, so the taste the first time is slightly different than when you've had a jar of the stuff for a few days, so I tend to leave mine in the fridge for at least 2-3 days before I open it. As suze mentioned, for those who like to cook meat, mushroom ketchup is quite well known. And for those who don't.